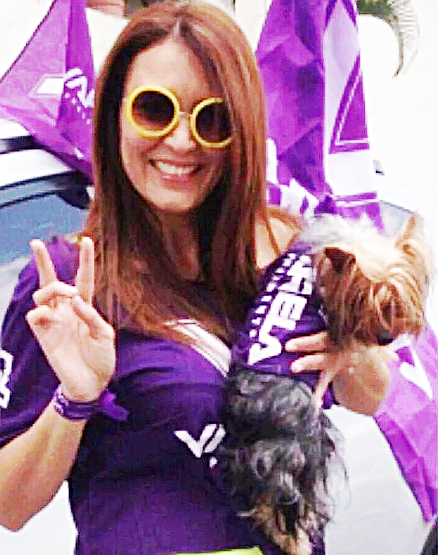 Zulema Sucre and Gucci the Yorkshire terrier on the 2014 campaign trail. Photo from Zulema Sucre’s Facebook page. Until recently Zulema Sucre, doctor’s wife and daughter of prominent Panamanian families, was vice minister of social development. She’s a Panameñista — a member of Panama’s oldest presently existing political movement — and a devotee of a far more ancient alliance, that symbiosis by which people and dogs bond with one another. The almost inseparable bond between Sucre and a Yorkshire terrier named Gucci might have been a bit happier experience had they been just a bit less separable, as in going to her job together and the vice minister taking Gucci out for a walk now and then, with Ministry of Social Development bodyguards in tow. But instead she ordered the bodyguards assigned to her to walk Gucci in the park, they rebelled and lost their jobs because of it, they complained through official channels and the tabloid dailies and in short order President Varela asked for and received Sucre’s resignation. Is it a matter of Panamanian political culture? Partly. Throughout his public life Juan Carlos Varela has put up with a lot, but one of them has not been people under his supervision making him, his ministry when he was a minister or his presidency now look ridiculous. This little flap surely did. Then consider that Sucre was and the bodyguards probably were political patronage employees. Were the bodyguards holdovers from a prior administration? Could be. They have not been identified so that it might be ascertained, but the Ministry of Social Development was the first of Ricardo Martinelli’s ministries to get caught in tawdry little financial scandals, starting with overpriced purchases from Martinelli companies for a groceries for gangsters program and then it degenerated into the minister’s drunken reckless driving in the course of which far more reckless gunshots were fired. You don’t get to be a ministry bodyguard without political or family ties — those folks are not like the more professional SPI presidential guards. Did the Varela administration keep any hacks when it took over the Ministry of Social Development? There were survivors, but there was much of the turnover than happens in government every five years. This was not Zulema Sucre’s first political job. She worked for Panama City’s municipal government during Bosco Vallarino’s sordid and shortened shift. The Ministry of Social Development, like the National Institute of Culture and a number of other government offices, has in Panamanian political culture been considered a proper place for a politically loyal socialite from the right family background. That sort of notion about qualifications is a terrible insult to social services recipients, artists and the taxpayers but to put it that way is to be considered a guttersnipe ingrate rustling one of the sacred cattle of rabiblanco philanthropy. But consider the matter from the point of view of canine culture. Go to Paitilla or La Cresta or Punta Pacifica early in the morning and you will run across all these maids walking the dogs of those areas’ upscale residents. The preference is for small dogs, often dogs with papers, animals that have been bought rather than rescued. (Dogs with bogus papers to inflate the prices, or despite papers with genetic maladies could have been predicted? There is a lot of that juega vivo too.) With dogs, and going upscale to horses, having a fine animal is quite the status symbol but taking care of the beast is a set of tasks to be delegated. At least, that’s a big trend among wealthier Panamanians. The notion that entrusting a dog’s care to a child is a part of the kid’s education in work habits, responsibility and humane values is not as big in upper class Panamanian culture as it is with either campesinos or gringos. One of the complaints about Sucre was that she allowed Gucci to ride in a government car, which is supposed to be reserved for the transportation of public officials and Very Important People. The former vice minister maintained that Gucci is a VIP and that was taken by Panama’s corporate mainstream press as something akin to Caligula appointing his horse to the Roman Senate. But so many of us of the gringo persuasion, or who know about Americans and the dogs with whom they cohabit, will understand. The dog is not just a loyal friend, but a member of the family. Of course the dog with whom one is bonded is very important. In her labor relations habits and in her expectations about the perks of public office, Zulema Sucre may have been typical of her caste of Panamanians. But her attitude about Gucci makes her an honorary gringa. Let this little Yorkie soothe her through her mortification, which really ought to be ephemeral given the gravity of the offense, and let Ms. Sucre and Gucci walk proudly together through the park, with their heads held high. There are higher forms of loyalty than the partisan ones.